After Russia’s incredulous penalty-shootout win over Spain, England are among a host of unfancied nations that now stand a chance of reaching the 2018 World Cup final. One of Croatia, Russia, Colombia, Sweden and Switzerland – teams that have never won the coveted trophy before – and England, will definitely reach the final. Spain and Germany were expected to be amongst the fray but in the last past week the last two tournament’s winners were knocked out. So who is most likely to progress through the knock-out stages and reach the 2018 World Cup final? Can England reach the 2018 World Cup final? England’s record of two knock-out stage wins since 1990 is appalling but after Spain’s exit The Three Lions are the bookies’ third favourite to reach the final. Amazingly, they would’ve been second favourites had Denmark beat Croatia in their penalty shoot-out. A tricky tie against Colombia awaits England at the Okritie Arena in Moscow but if England squeeze through there then a favourable quarter-final match up against Sweden or Switzerland awaits. But despite that, the knock-out stages are not kind to The Three Lions. 1966 aside – they have never defeated a top-tier side and the only elimination games England have won since their infamous 1990 semi-final run were against Denmark in 2002 and Ecuador in 2006. Gareth Southgate’s squad is young and was the second most inexperienced at the start of the tournament too. But England can draw encouragement from the fact that they are the only side on this side of the draw to have won the World Cup and, besides Sweden, no-one else has even reached the final before. There were jubilant scenes across Russia’s 11 different time-zones when the hosts knocked out 2010 winners Spain in a penalty shoot-out. In the land of revered goalkeepers, Igor Akinfeev produced heroics against the much fancied Spain to take Russia to their first quarter-final in 48 years. Expectations were originally low for the 2018 World Cup but it appears the nation came on board after Russia’s swash-buckling opening game wins against Saudi Arabia and Egypt. 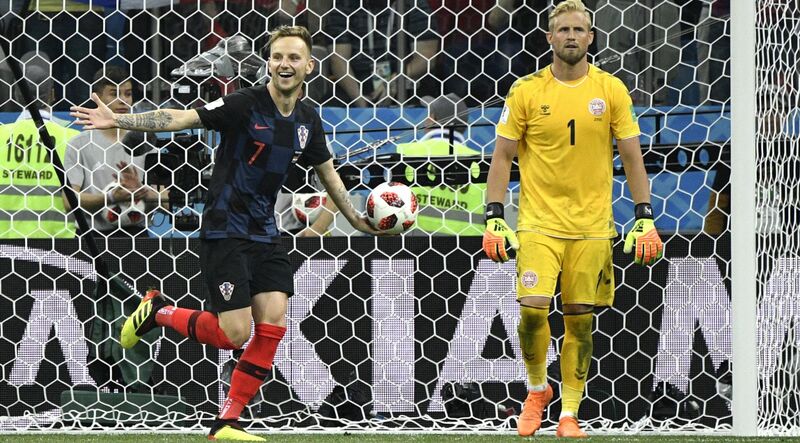 Arguably the strongest side left on this side of draw, Croatia’s victory over Denmark was the first time they’d won a tournament match that went beyond 90 minutes. The Croats lost on penalties at Euro 2008, extra-time at Euro 2016 and have only gone past the round of 16 once previously – at the 1998 World Cup. Their squad is littered with winners and players with high-level knock-out experience at the highest level. Luka Modric and Kovacic have enjoyed Champions League success with Real Madrid as has Ivan Rakitic with Barcelona. Mario Mandzukic meanwhile has won a league title in five of his last six seasons. Reaching the 2018 World Cup final would seem the next logical goal in their careers. Buoyed by their buck-breaking World Cup last 16 win, Croatia will face Russia optimistic of their chances of repeating the feat their 1998 team achieved – reaching the semi-finals. You would have to go back to 2002 to find the last time a side reached the final without facing a side from that elite clique of footballing nations. If you don’t want to count England among that clique, then Colombia could repeat Germany’s feats in 2002. At that tournament, Germany beat Paraguay, the United States and co-hosts South Korea. Colombia simply don’t have that same pedigree having only been to the quarter-final once in 2014. Radamel Falcao, Juan Cuadrado and James Rodriguez have all won major titles at club level and stand out as the most experienced players in the sideas they attempt to reach the 2018 World Cup final. The winners of the England vs Colombia match will face either Sweden or Switzerland. The Swedes last reached a semi-final in 1994 whilst the Swiss have never been beyond the last eight. The winner of this tie but might been seen as the favourable match-up for either England or Colombia but it is anything but. Sweden have already made a name for themselves as the ‘giant killers’. Drawn in a World Cup qualifying group with France and Holland, they snatched a second placed finish sending Holland crashing out. Drawn against Italy in the play-offs, they defied the odds again beating the Azzuri over two legs. Also, it was their three goals against dark horses Mexico in the last round of the group stage that effectively killed off Germany’s chances. Still Switzerland remain favourites to win this tie with a qualifying loss to Portugal their sole loss in their last 25 games.